How can we use art (I mean any kind of creativity, not just drawing and painting) to access our emotions, get them out of our body and share them with vulnerability? The more we keep them inside, the more these feelings will come out in harmful ways such as damage to our body, inappropriate interactions with others or self-harm. A word about Vulnerability - Brené Brown says that in order for connection to happen, we have to allow ourselves to be seen. I think that is true not only for connection with others, but in order to connect with ourself. When we connect to the most vulnerable places within ourself, we can access a deep empathy with those painful or joyful parts and healing can happen. When we share those powerful moments with others, through visual art, writing, music, etc., those people connect with our unique perspective and in turn they will be more likely to connect on a deeper level others. It's the gift that keeps giving! Free writing - This is a way to access your subconscious thoughts or feelings through stream of consciousness writing. Free writing can help you access the powerful emotions that lie beyond your thinking / logical mind. If you are having trouble even knowing what kind of emotions are there, I think this exercise can help. • Choose one word or emotion and set a timer for 3 minutes. Write as much as you can, without stopping, pausing, editing or thinking too much. If something intense or raw comes up, there is probably something with a lot of energy there, don't avoid it but just keep going. After you are finished, go back and highlight words or phrases. Try drawing them, incorporating them into your artwork, music, poetry or whatever creative practice you have. Color / Line - Visual art can be a powerful way to express feelings. Line and color can indicate emotion without having to render an actual representational image. Abstract to expressive art can make you cry or gasp with it's intensity. • Gather some markers/ colored pencils or crayons and make a list of a few emotions you may be feeling. Pick one of the emotions and choose a color that you feel represents that emotion. In a sketchbook or a piece of paper, start making marks that feel like that emotion. If I picked sadness, I may use a blue crayon and make loopy marks, if I choose anger, they may be red, jaggedy marks. Go through all of the emotions, keeping them on the same page or using other pages. Keep these lines handy and you never know, they may end up in your next painting! Music - I don't have to tell you that music is powerful, we've all had an experience when a song or lyric moved us so strongly we had to move our bodies, or cry or sing. A couple weeks ago, I had so many emotions inside of me, I turned up the music in my house and danced like crazy to nearly the entire album. • Try picking an album or creating a play list that suites how you are feeling right now. I have a playlist called "angsty", and another called "meditative". Put on your headphones and dance around the room, or just feel your body and emotions and follow the movement. You could also try finger-painting to the music or painting / drawing to the music in an intuitive way. "The creative process involved in the making of art is healing and life enhancing". Symbolism / Archetype - It's nice to be able to make something that can be a representation of us or how we feel and put it out into the world. It can help us to express ourselves without having to be too literal. It can say something that we don't have the words for yet. I recently bought a beautiful book, The book of Symbols and in it's preface, there is this quote, "Poetry, like symbols, expresses that which cannot be said" Using symbolism can help to get these emotions out of us and onto a paper or craft, so we don't need to hold them in our body or repress them. Art therapy has used this idea in order to help children and adults to better understand their feelings. Because, growing up I was taught that being angry or loud is not good, I have recently created a cat character who comes out in my sketches when I am feeling negative emotions, it feels pretty great to be able to express those things in some way! 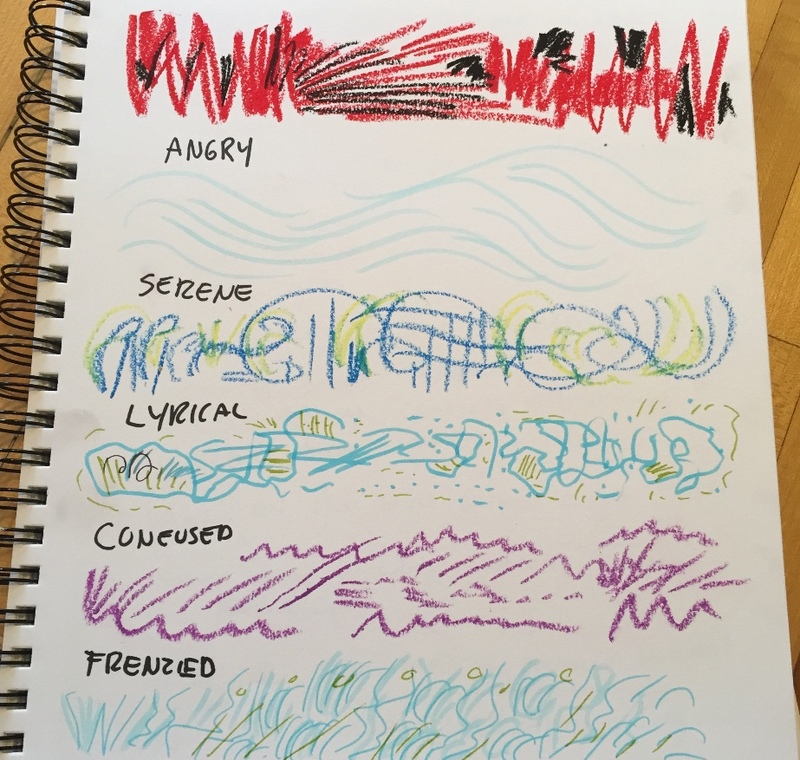 • Choose one of the words from your free writing or Color/ Line work and do a brainstorm session, thinking about what kind of symbols embody these emotions. Weave these symbols into your art, writing, crafting. • You may also want to create a character that represents certain aspects of you, it may turn into a series. Write stories about your character. Draw it, bake cookies that look represent it!!! There is no limit to how creativity will work through you. I hope this has helped you get some ideas to access your emotions and get them out into the world. Stay safe out there, and let's be kind to ourselves and others. TAKE A STEP IN EXPLORING YOUR TRUE CREATIVE VOICE with my new e-course! For beginners or experienced artists, this course includes 6 Modules and 12 exercises (plus 3 special Pintrest bonus exercises) that take you through an entire project from finding inspiration, getting in touch with your Inner Artist, learning how to use the materials and bringing it all together into a finished piece. You can access all of the videos right away so that you can work at your own pace. You will have access to all of the resources so that you can always catch up later. Enjoying my blog? Get more inspiration, tips and tricks for your creative journey by signing up for my newsletter! Also get discounts on my shop and classes!